That Miller-Acosta scuffle in the White House press room over Emma Lazarus’s poem happened a week ago. I wonder when Carney thinks Vogue did this photo shoot? I wonder when he thinks they picked this particular shot for their September cover? I wonder when he thinks it went to press? I’m pretty sure the answer to all these questions is “before August 2nd.” I’m also pretty sure that about 100 percent of Vogue’s readers would miss the supposed reference anyway, which is only understandable to the most obsessed of political obsessives. 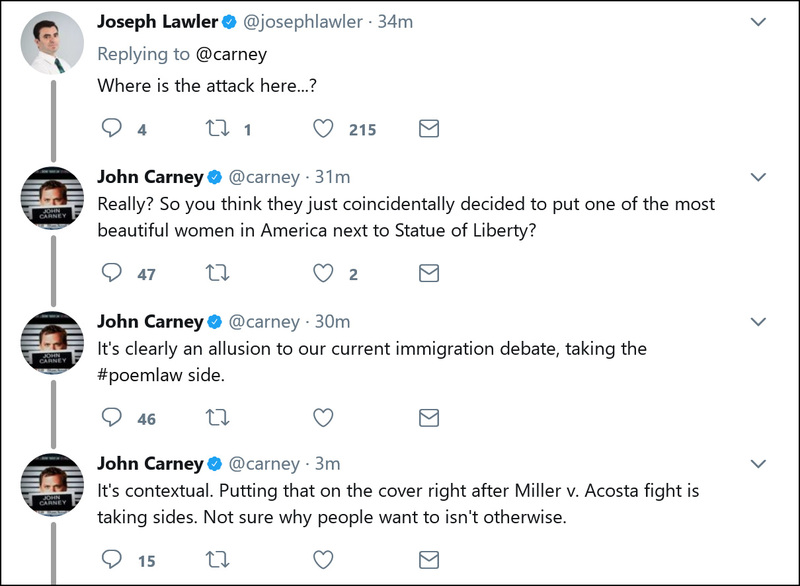 And I don’t see how this shot takes one side or the other of Miller and Acosta’s famous successor to the Lincoln-Douglas debates. But maybe I’m wrong. Someone should ask Anna Wintour, I guess.